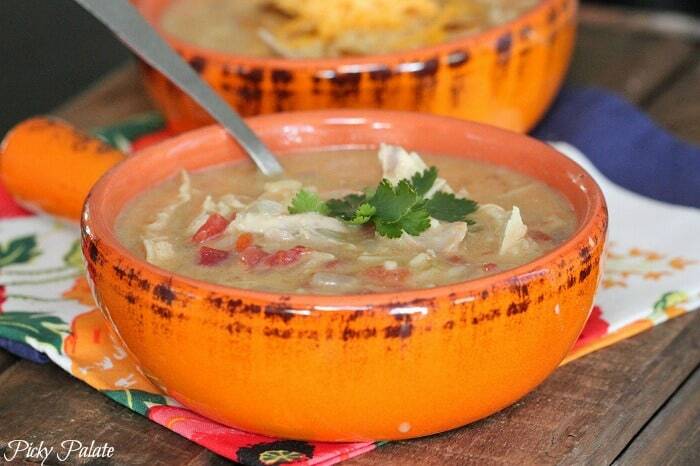 Sharing my Slow Cooker Chicken Enchilada Soup Recipe today! Crockpot Soups are my favorite, you’ll love this flavor packed slow cooked hearty soup! 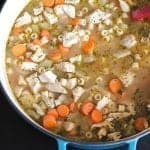 I go in these crazy crockpot soups recipes where I use it all the time and I am loving it right now. Last week I whipped up a giant pot of my Slow Cooker Chicken Enchilada Soup. It’s warm, thick and complete comfort food in a bowl. 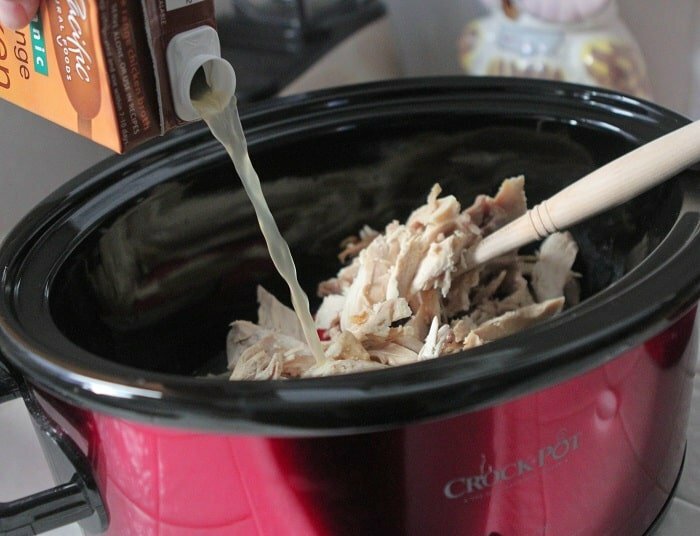 Slow Cooker Soup Recipes are so great this time of year. You can easily split the recipe if you don’t need to make such a massive amount, but I’ll warn you, it’s incredibly delicious and you’ll want the leftovers. Let’s take a look at what you’ll need. Cook them in a large skillet over medium heat. Transfer right to a LARGE crock pot. I’m talking at least a 5 quart. I used one whole rotisserie chicken for this recipe. Discard the skin then shred the meat. It’s about 4 cups if you want to bake your own chicken. 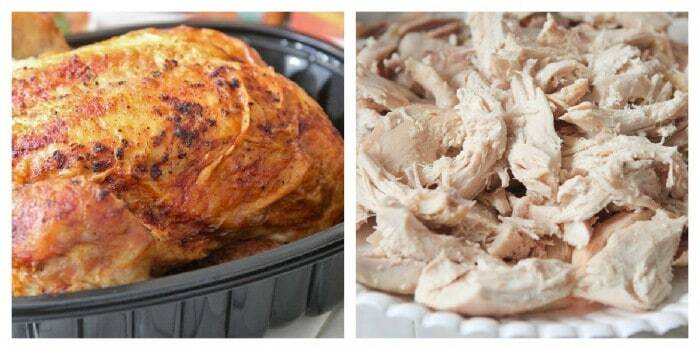 Transfer the chicken pieces to the crock pot. Add your chicken broth, 32 ounces please. 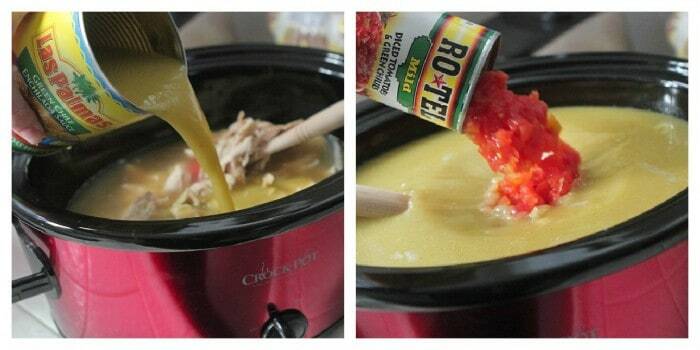 Pour in two 28 ounce size cans of green enchilada sauce and two 10 ounce size Rotel diced tomatoes. Make sure both say MILD on the can. I added two packages of cooked Spanish rice. It thickened the soup so nicely, I definitely recommend it. I used the Knorr Brand, but any of your favorite Spanish Rice will do. If you’d like to make your own, use 4 cups. 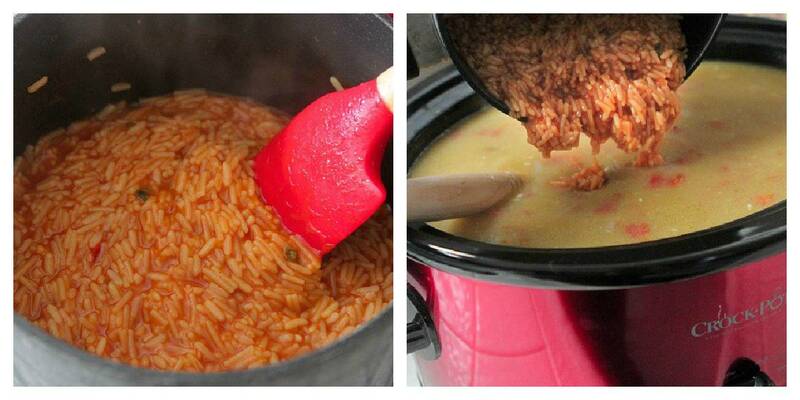 I have a great Homemade Spanish Rice recipe HERE if you need one. Scroll down past the tacos and you’ll see it. 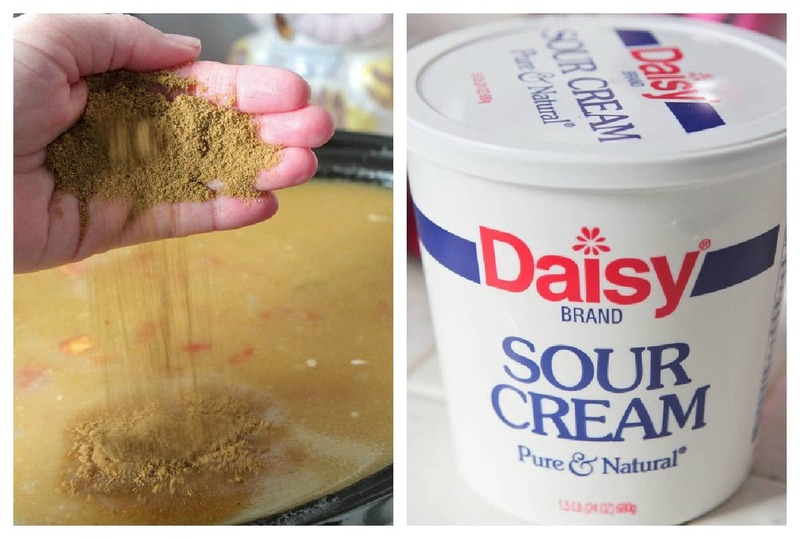 Add a good handful of cumin and 8 ounces of sour cream. Stir and let cook on low for 4-8 hours. *Use Rotisserie chicken when possible. Saves lots of prep time. *I also like to purchase pre-chopped vegetables in the produce section to save even more time. *Serve soup with a nice green salad and crusty bread if desired. Heat oil in large skillet or pot over medium heat. 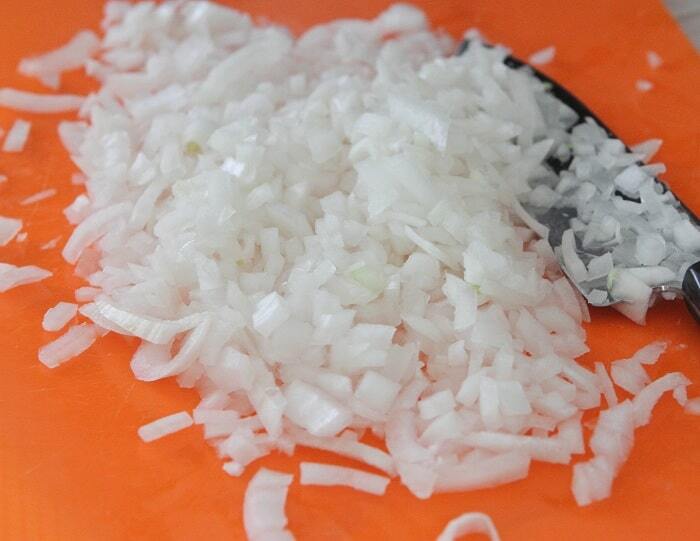 Add onions and cook, stirring for 5 minutes until softened. 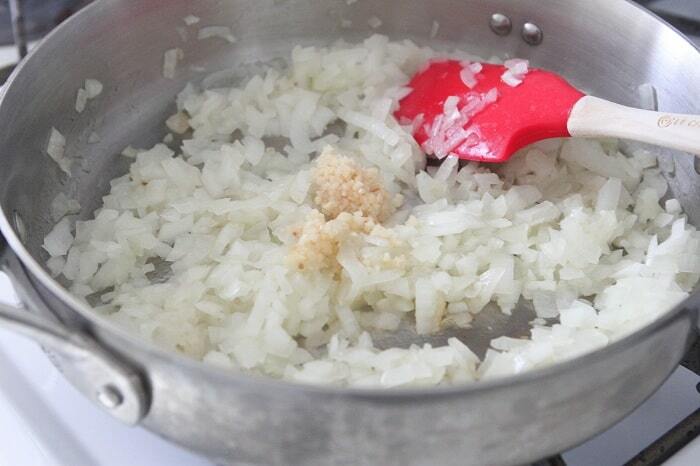 Stir in garlic and cook for an additional minute. 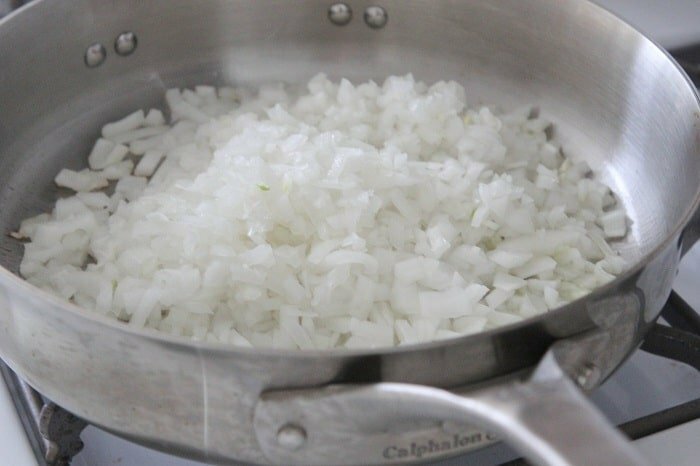 Transfer to a large 5 quart minimum crock pot with setting on low. You Ever Eaten New Orleans Style? You always have the best soup recipes. And I bet this soup makes a ton, which is always a good thing. It sounds great! This soup sounds perfect for a anytime, but especially for serving a crowd! You have been making some incredible soups lately, and I’m loving it! Thank you!! YUM! This is a perfect weeknight meal that is simple to put together but so delicious to eat. I am definitely saving this recipe. Thank you! 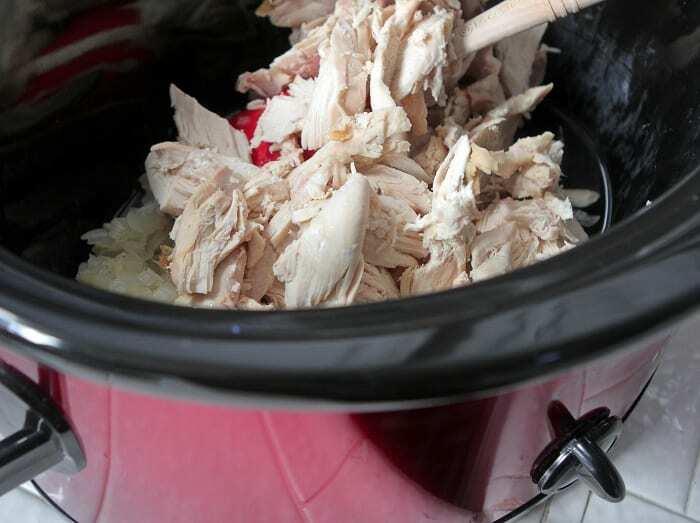 How might you cut this recipe for a mini-crockpot? I LOVE enchilada soups! This is perfect for anytime and especially the big game coming up! This is one of my favourite soups! 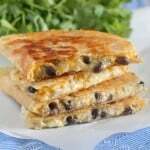 It is so easy and always tasty! One Crock-Pot full would not be enough! I love the looks of this!! I may try subbing in Greek yogurt for the sour cream. Thanks for an easy delicious looking recipe. I was just thinking the same thing and came to read whether anyone had tried Greek yogurt instead. Hope you see this and report back! Looks fabulous, my dear! I always love adding slow cooker recipes to the ‘ol “must try” folder! dumb question – this looks amazing!!! do i have to put in the rice? what could i substitute with? – to make it thicker? maybe some cream of chicken soup? and top with chips and cheese? What a perfect meal for the weather we’re having! Can’t wait to try! Love that this is a slow-cooker recipe! 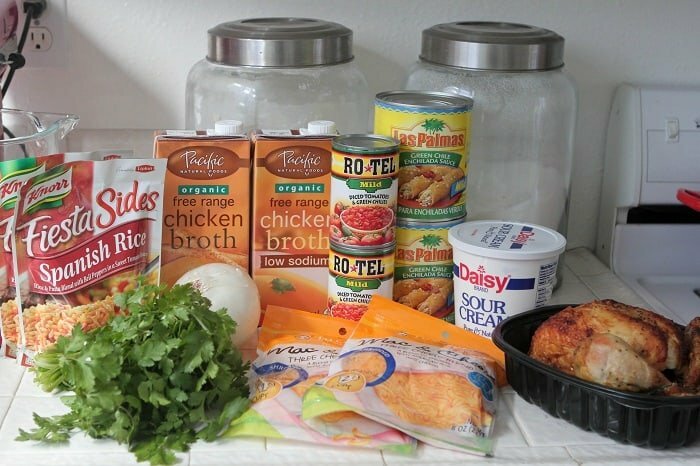 I am always looking for soups I can throw together in the morning and easily enjoy later on. Perfect for the FREEZING weather we’re having!! Oh, I am the same way! I’m cray for my crock pot right now. Great recipe, Jenny! Hey Jeff, Down at the bottom it gives you an option of printing. If you don’t like the photos this might be for you. I hit print and when it pops up I say print as PDF. It then prints just the recipe and I save in my recipe folder. sorry prints PDF right onto my computer and I hit save to my recipe folder on my desk top. I just love what you do to me. I make a soup every week at the beginning of the week for lunches…and I am so glad you posted this one today! I already have everything to make it, Yay! We both posted slow cooker recipes today! Can’t wait to try your recipe! 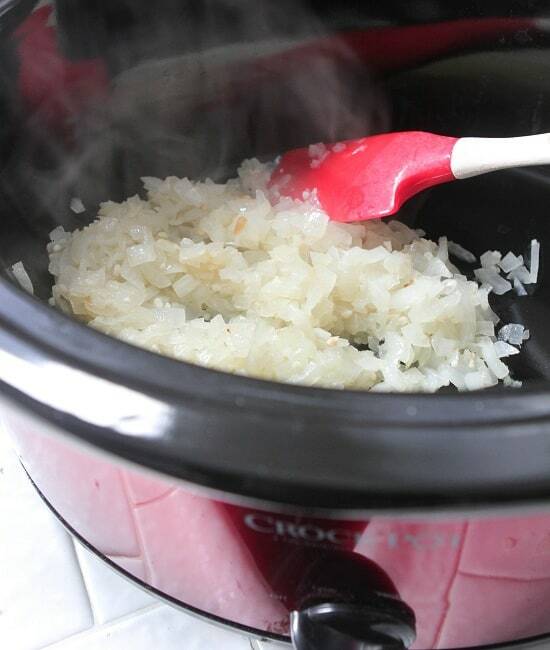 LOVE this slow cooker idea jenny! I have all the ingredients for this one on hand – Monday night dinner for sure! Cannot wait to try this one!! The pictures alone convinced me – thank you! Can’t wait to try this, and I have a rotisserie chicken that wants to be used right this very minute. This is my kind of soup. I love the flavors and we love rotisserie chicken! 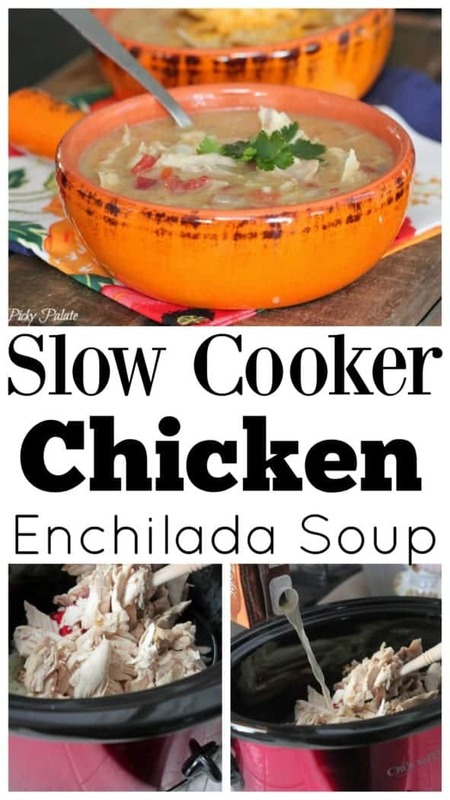 Definitely going on my list of recipes to try – love the slow cooker and this looks like a great soup! This is a recipe I really need to try, thanks so much that looks delicious! have to try this one. Great one for winters. This is so perfect for the recent blast of cold weather we’re getting in NYC. Will definitely all it to my weeknight menu! Looks delicious! Wonder if this would freeze well. Has anyone tried? With the cold we’re having in our area, like many others, this would be perrrrfect!! Yummy! 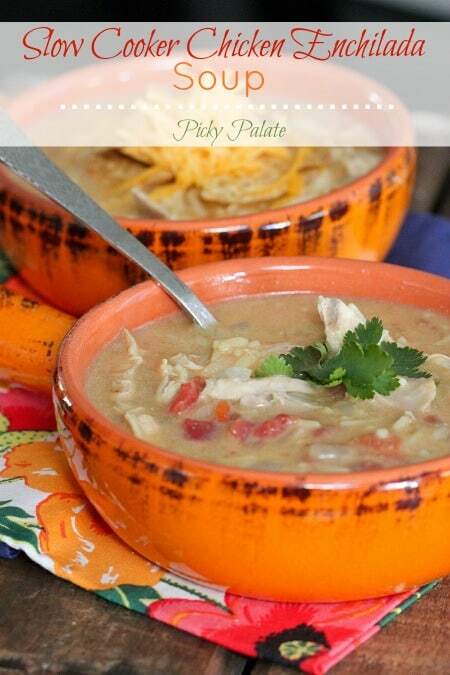 I love soup and I especially love enchiladas so this is calling my name! I made this last night – it was perfect for the wind chill advisory weather we’ve been having in New England! I halved the recipe and used regular red enchilada sauce since my grocery store didn’t have green, and it came out great. It had quite a kick to it, so it was great with a little bit of crumbled cornbread mixed in! Great to hear Megan! Thanks for sharing! Coming home at the end of a cold winter day to a crock full of this soup would be wonderful! I can’t wait to try it. Thanks! Yay! Hope you enjoyed Wendy! I made this on Saturday with company coming over. We all thought it was delicious. We especially loved it the next day. Thanks! I just made this and it was absolutely delicious! For all the other penny-pinchers out there: I boiled my own chicken pieces, then shredded it, and used the water as a broth and just added a chicken buillon cube! Fantastic though, big hit at my potluck! Looks so delicious! Your photography is amazing!! Looks so yummy! I am going to try this out next week. It will be more than enough for my family, so I’m wondering, will this freeze well? Just made this and it’s delicious!! I usually tweak recipes to our taste but this one is perfect as written! Thanks for an awesome recipe!! Thank you for the recipe. Made it for an office potluck, and won!